Spinal cord injury in adult humans can be devastating with little or no recovery of function, due to the inability of the Central Nervous System (CNS) to regenerate functional axonal connections after damage. However, recent studies have demonstrated that the failure of the CNS neurons to regenerate is not an intrinsic limit of the neuron, but is strictly related to the damaged environment that forms at the site of injury (e.g., formation of scar tissue) and that can lead to neuronal degeneration and cell death. Several strategies can be adopted to impede or limit neuronal death, such as transplantation of exogenous cells (e.g., Neuronal Progenitor Cells, NPCs) and local delivery of molecules that are able either to stimulate axonal growth or to attack inhibitory proteins. Our team aims at the production of biodegradable poly(lactic-co-glycolic) acid (PLGA) microspheres (Figure 1), for the encapsulation of bioactive environmental regulators and/or inhibitors of bone morphogenetic proteins which sustain the formation of the glial scar. These may support the spinal cord regeneration, when injected in vivo upon experimental focal contusion cord injuries. The procedure of encapsulation of such molecules within injectable and biodegradable PLGA microspheres allows their controlled and sustained delivery right at the site of injury. PLGA microencapsulated environmental regulators are gradually released into the surrounding extracellular space by means of both a. diffusion throughout the polymer matrix as well as b. hydrolytic degradation of the matrix itself. A number of evidence – from our own and other laboratories – suggests that the peptide release profile from PLGA microspheres might be either biphasic or triphasic (Figure 2). In the first phase, a burst release is achieved, due to the short diffusion pathways of near-surface entrapped molecule or surface-adsorbed molecule. In the second phase, the release rate decreases until plateau is reached, due to the combination of both diffusion and polymer degradation. The third phase, when present, consists of a ‘late’ increase of the release rate, due to the erosion of the remaining polymer and subsequent loss of the mass microsphere. Our specific goal is the optimization of the release kinetics, in order to synchronize the release of each specific environmental regulator with the time length of the biological process to target (eg., axonal/neuronal protection and/or inhibition of the glial scar formation and/or optimized differentiation of transplanted NPCs). The tight control of the initial burst phase is necessary to obtain a gradual, though time-sustained release of the given bioactive environmental regulator at the site of injury (i.e., from hours, through days, to weeks). The release kinetics can be tuned by acting on some design variables, such as the polymer (e.g., PLGA) concentration and the amount of the encapsulated peptide, which affect the synthesis process and, as a result, the microsphere properties regulating the diffusion and erosion phenomena (e.g., the diameter, the porosity and the degradation rate of the microspheres). Figure 1. 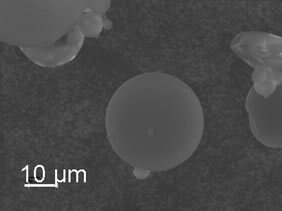 PLGA microspheres produced by means of a double emulsion/solvent evaporation technique. Figure 2. 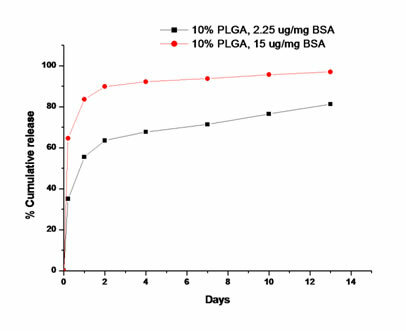 Biphasic release profiles of Bovine Serum Albumin (BSA) from two microsphere formulations, obtained by loading two different amounts of BSA.